First few laps should be interesting. Expecting a Hamilton resurgence as this track has been dominated by Mercedes. 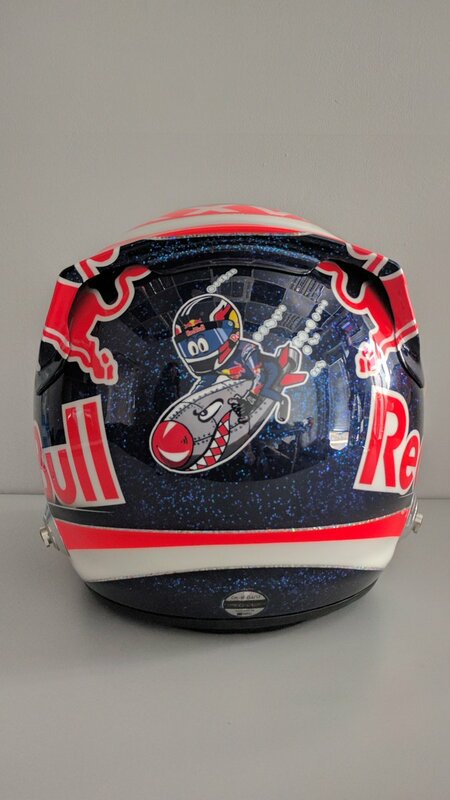 Kvyat has a very special helmet for this weekend. Every track has been dominated by Mercedes since 2014. I don't think that's a reliable measure! True, I do think this track will suit Mercedes though and Spain will suit Ferrari. I'll happily be proven wrong but I have a feeling this will be a comfortable weekend for the silver arrows. You're probably right. I just thought the reasoning was a bit suspect! That's what I meant even Zoue. Vettel has a better chance in Spain. Here Hamilton should coast to a victory. Hopefully Bottas can/has overcome the issues he encountered in Bahrain and challenges Lewis. I hate this track, it's absolute garbage. T3's not bad but yeah the rest ain't great. Agree with Black Flag above. Low tyre deg here should help Mercedes as well. Ferrari did win Bahrain though, and there were rumours they did so with their engine turned down a bit because of worries about their Turbo. If that was true and it is solved then it still could be close. McLaren have MGU-H fixes in place so hopefully Stoff can at least get out the bloody garage. Improved mapping giving better power delivery(Might be able to actually get on the throttle less than 10m after a corner now!) and helping reduce vibrations(Might be able to change gear normally now!!). Haven't heard much from Red Bull at all. ...And Massa, and Wehlrein,... and go all the rest after them. It's the cold temperature and the high percentage of the lap that is taken flat out that really bodes well for Mercedes. It will not be an easy victory though. Ferrari will be right there; even on a track that suits Mercedes better. Barcelona will have hotter track temps and a lot more twisty bits. That should definitely be Ferrari's track. 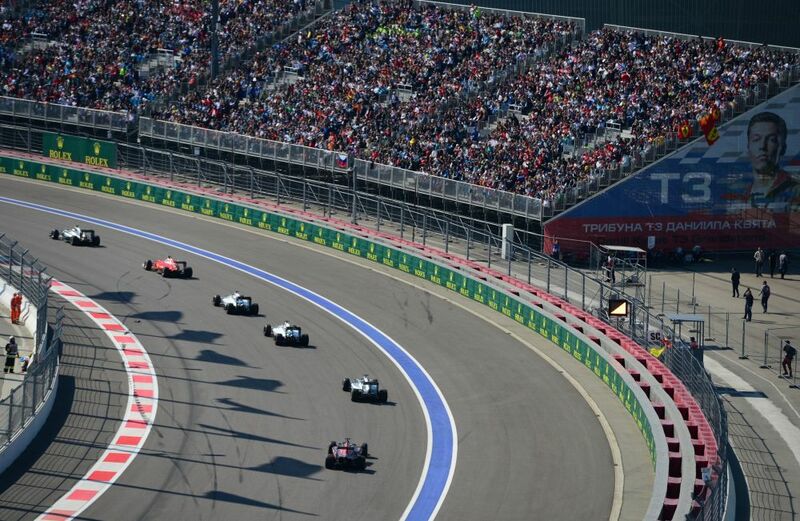 The track is bland as hell, and it will be very hard to overtake, but I still looking forward to the race. I think people are sleeping on Ferrari. Looks like most people are expecting to do a one stopper, but I have a feeling the guys in red are going to try something different. I hope Lewis wins, but it won't be easy. If Spa is the equivalent of giving me an erection, then Sochi pushes it back so far that it looks as though I have lady curtains. I've seen better corners on a bottle opener. Should be a good race, though. ANYONE having issues with SkyGO on their windows machine? God I hate Sky commentary - just turned on and they are talking about which is the longest city in the world. Really!? Thankfully just realised its on Channel 4 too! I'll take it! Just copy and paste into the sunday results and I'll be happy. 1st engine related penalty already here! So much for the positivity after the 2nd day of test at Bahrain. How long before they surmise that Hamilton has 'an issue'... because Bottas outperforming Hamilton on the same tyres is unfathomable. Based on some comments, they're just removing and fixing up turbos fairly regularly rather than having to remove broken parts so may not be as bad as it appears. Time well tell though. What's going on with the respective pace of Ferrari and Mercedes here? Hmmmmmmmmmmm. Interesting to hear Christian Horner say, from all the relevant data at their disposal, Ferrari have the fastest race car? Ben Edwards concurred. Groan, discussions are underway for giving points further down the grid, so further rewarding reliability with what I can guarantee a further devaluation of race wins. Why do I seem to have always the opposite opinion to Crofty he just grinds on me, like you may be watching race and he will say it's getting a bit boring a SC would soon liven it up, that's not what racing is about. Different track, different strengths and weaknesses. All that positive talk was just that, talk. Results matter and now Honda has their first engine penalty. Every improvement simply does nothing to advance McLaren. Big discrepancy in the 2nd sector. That ferrari has some downforce. Looking more and more like mercs only saving grace is their power unit. Qualifying should be super close. If they cant get both cars to the finish line on sunday they should just go home already. Too embarrassing. Oh they are just referring to today? From the media comments I've heard, it sounds more serious than that. And with the rule changes on penalties this year after what Hamilton did last year, Seb will need a miracle to win the championship. No, both Christian & Ben talked in terms of Ferrari being the benchmark this year so far, the class of the field.